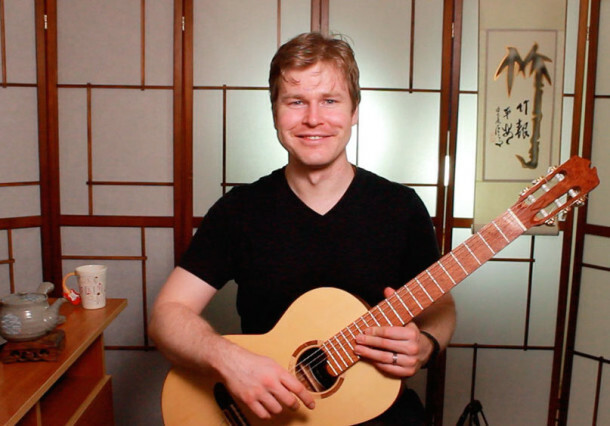 Welcome to Episode one of Fret Dojo TV! I’m very excited to put these videos out where I share my knowledge of guitar techniques and styles. This episode covers how to do the hammer-on and pull-off techniques on guitar effortlessly, and includes some exercises to give you a way forward in improving this technique. They might seem a bit tricky but it these are pretty straightforward techniques to learn if you have a good understanding of the principles. So what are Hammer-ons and Pull-offs? These techniques are common to pretty much every style of guitar playing, and they are really important to learn as they help lines sound much smoother (known as legato in music speak). What they essentially are is playing the guitar with your fretting hand instead of your picking hand, and collectively are known as ‘slur’ techniques. Slurs are essential to improve your speed on the instrument when you are doing things like fast scale runs and so on, as they make it much easier to play lines quicker. Doing slurring exercises can also help to drastically improve coordination of the left hand. I hope you enjoy this video and that it helps to remove the roadblocks to getting better at these techniques. Hammer-ons and pull-offs are really important to learn for whatever style of guitar playing you are doing and in the end as long as you know the basic principles and practice them properly they are quite an easy technique to develop. 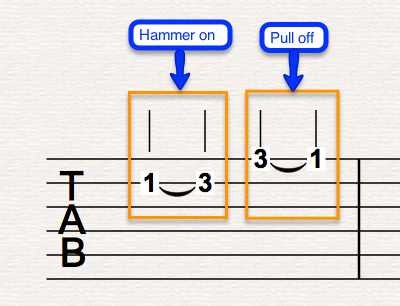 Get your free copy of ‘Essential Hammer-on and Pull-off Exercises for Guitar’! To help you quickly master these techniques I’ve put a pdf of what I consider to be the most important slurring exercises on guitar. There’s often books with pages and pages of these sorts of exercises included, however you only need to boil it down to a few of these these to develop your hands. Enjoy! Hammer-on and Pull-offs are notated in music like this: Note that the curved line joining the two notes is identical to the one used to tie two note values together. You can tell though if it is a slur as the two notes are different instead of the same in the case of a tie. 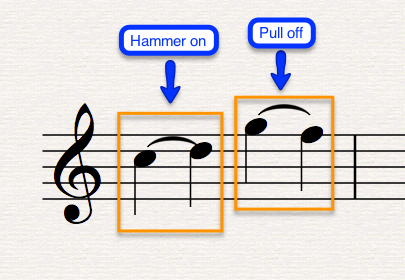 If the note goes from lower to higher then it is a hammer on, vice versa it’s a pull off. 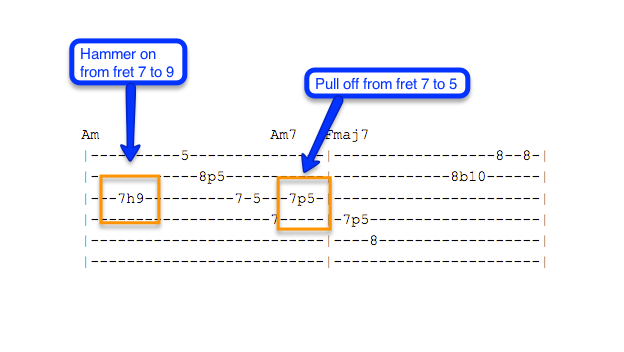 In notated tab, they look like this: And in what I call ‘internet tab’ (like what you would download from a site like ultimateguitar.com), they look like this: Thanks very much for reading and I hope you found this article useful. I would really appreciate your feedback, so do let me know what you think about this video by leaving a comment below. Also, if you would like to see something in particular explained in a future episode, I would love to hear from you! You can get in touch touch with me via this contact form. Peace! For your first video,AWESOME.Great Job.Keep them coming my friend. Thanks Jackie! Thanks for your support, it is great to know that you enjoy them. Yes I’ll have to get back in the video studio soon!